Have you been squaring off with a headstrong, determined, and fiercely independent toddler whom you love more than you can possibly believe? Yeah, me too. 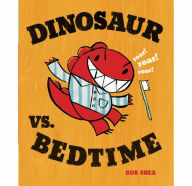 Fortunately author Bob Shea and his leading man, Dinosaur, go through all of the same amazing up and downs we and our toddlers experience every single day. Even when the fight seems to sway out of control, you can relax in the knowledge that Shea and Dinosaur, with some fun and engaging art, will find a resolution that will satisfy everyone. Don’t believe me? Check it out! Preschool is amazing! There is so much to do and so much to see and there are so many people to play with! But then, out of nowhere, Dinosaur is faced with the dreaded clean up time. 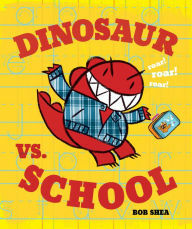 Who will win, Dinosaur, the teacher, or the class? Little readers will love to see someone who shares their feelings about cleaning up. 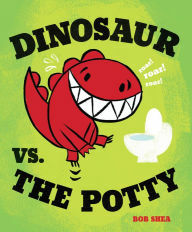 A Dinosaur afternoon filled with potty-inducing liquid-based fun and, wait for it, no need to rush to the bathroom! How long can Dinosaur hold out before he has to make the made dash to the bathroom? Will he make it in time? Can you handle the suspense? Potty training isn’t easy, but we all know it can be hilarious. Everyone loves story time, even Dinosaur. Dinosaur also loves to run, jump, ROAR, and hang out with all of his friends. Dinosaur does not like having to sit still and listen quietly though. 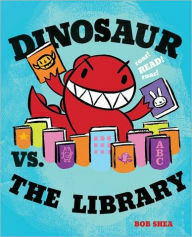 There is no telling who will win this showdown, but my money is on Dinosaur. Added bonus if you read this book in preparation for a story time out on the town! It is a tie between which battle is most epic, the one at bedtime or the daily fight with mommy. Showering, grocery shopping, and other daily tasks all are met with the overpowering “ROAR!” of Dinosaur. At the end of an exhausting day, Mommy and Dinosaur have one last showdown, one that will fortunately melt away all of the stress. Dinner, bath time, pajamas, and the toothbrush all fall before Dinosaur and his amazing powers! Can Mommy and Daddy, with the powers of exhaustion on their side, get Dinosaur into bed? 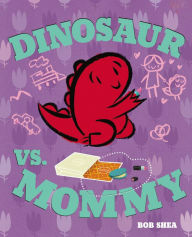 Tired readers will sympathize with Dinosaur, Mommy, and Daddy as they snuggle up for one last read. 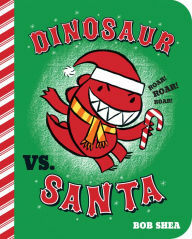 The holidays are upon Dinosaur and his family. Together they decorate, shop and—shock of shock—behave themselves. When the jolly red-suited man makes his way down the chimney at Dinosaur’s house, he has to muster all of his self-control. Has he finally met his match? What battles do you and your little Dinosaur have?